The Jardin des Tuileries is located in Paris's first district, surrounded by the Place de la Concorde, the Louvre, the quai des Tuileries along the edge of the river Seine and rue de Rivoli. If you are planning to enjoy a stroll in the Jardin de Tuileries, bear in mind that it's impossible to park your car in the surrounding streets. It's best to book a parking space in advance in a nearby car park. ParkingsdeParis.com recommends the Pyramides car park just 3 minutes away from the Jardin des Tuileries or the Louvre Samaritaine car park, on the other side of the Louvre, an 8-minute walk from the Jardin des Tuileries. 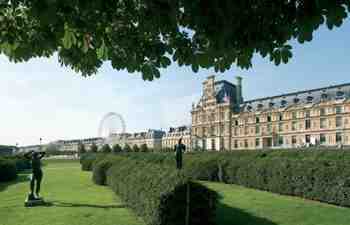 Don't miss your visit to the Jardin des Tuileries simply due to parking problems. The Jardin des Tuileries (the Tile Works Garden) owes its name to the fact that in 1564 Catherine de' Medici had the Palais des Tuileries (now sadly gone) built on the site where the tile works were based back in the 13th century. From 1664, at the request of Louis XIV, the famous gardener André Le Nôtre gave the gardens their current French-style layout. A favourite spot for walking and cultural activities where statues by Maillol can be admired along with those of Rodin and Giacometti, the Jardin des Tuileries attracts numerous visitors thanks to the sheer diversity of its range of activities. With a surface area of 25.5 hectares, this is the largest French style garden in Paris with two large pools and delightfully relaxing lawns. For art lovers, the Musée de l'Orangerie exhibits works by Monet and the Jeu de Paume presents contemporary works of art and photographs. Children can go for pony or cycle rides along the paths. The Fête des Tuileries (Tuileries Festival) is held from June to late August, with fairground rides and the Big Wheel to admire Paris from up high! To really enjoy your time at the Jardin des Tuileries, avoid the unnecessary stress of trying to park by booking your parking space in advance via our website !